Probably, you might or not have noticed, you readers can now print the recipes here on Random Cuisine without my blablas and pictures. All you have to do is to click on "Printable Recipe" which is found before the "Ingredients" section and then simply print the recipe out. Another change is that you can now click-to-enlarge my pictures and see every details of the image. Let me know what do you think of the new changes. Right now, I'm taking a break of writing about my trip to Seoul. I'm finally back with my usual collective cooking with my friends. One of my friend loves the show Chef at Home and he gets most of his recipes from that show. 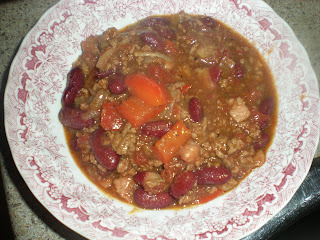 Today, he made chili with bacon as a flavor enhancer. Here is his inspirational recipe. You can adjust the seasonings to your liking. 1. 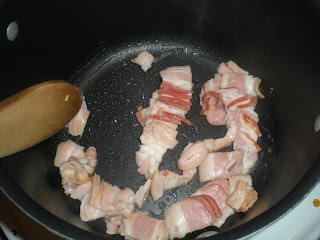 In a large pot, cook bacon with a splash of water over medium-high heat until it turns brown. 2. 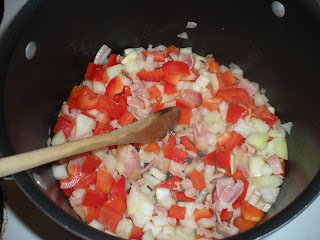 Remove excess of fat and add onions, garlic and red peppers. 3. Cook until onion becomes transparent and pepper softened, about 5 mins. 4. 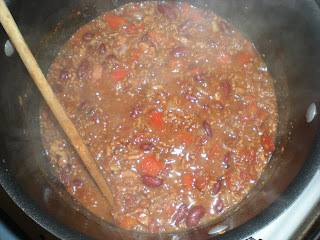 Add cumin, paprika, coriander, oregano, cayenne pepper, and ground beef. Stir and cook until beef starts to turn brown. 5. 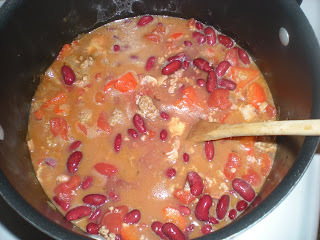 Add tomatoes and beans. Season with salt and pepper. 6. Simmer for an hour, uncovered until it becomes thick. Stir time to time. If after an hour, it is still too liquid, turn the heat to high and let it cook for a few mins until thickens while stirring, then turn off the heat. Serve. Victor, this sounds like a delicious, hearty meal.